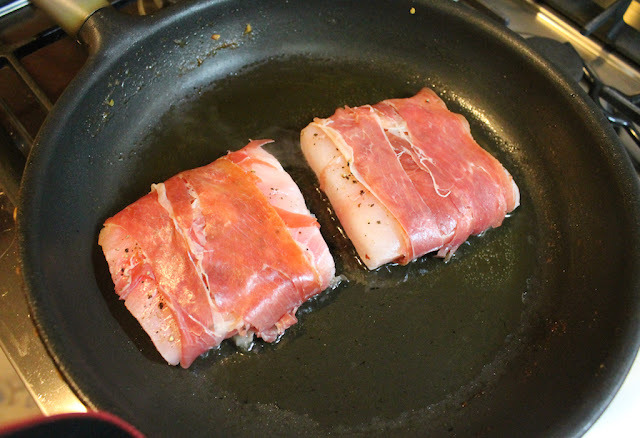 Add extra flavor to your fish by pan-frying it wrapped in Parma ham, then sit it on a succulent bed of spicy tomatoes and olives, perhaps with pasta underneath, for a beautiful and satisfying meal. I’m not sure if the two things go hand in hand for everyone, but we are beach people and we love seafood. There's nothing we enjoy more than traveling somewhere where the catch is fresh and putting it straight on the grill or into a pan! 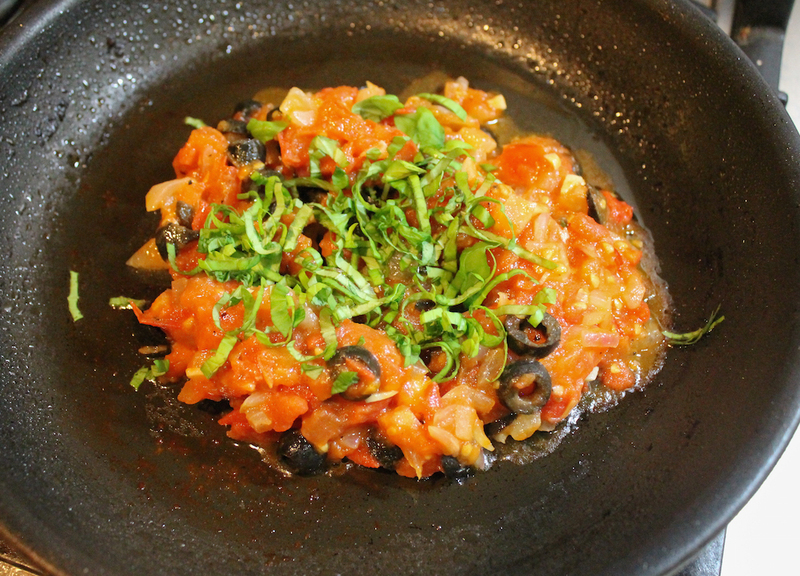 In fact, our favorite fish dish, ceviche, doesn’t even require heat! So when my friend, Wendy from A Day in the Life on the Farm, asked me if I’d like to join a group she was forming, with the aim of putting more seafood on our tables in the name of health, I thought, sure, and yes, please! 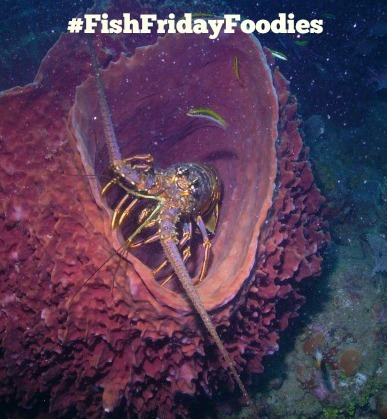 We do already eat quite a lot of seafood here - easily once or twice a week – so I’m looking forward to seeing all the great recipes my fellow bloggers will share for Fish Friday Foodies. The Parma-wrapped fish in this particular recipe is so good that we had it twice in one week! Once one its own, and then with this chunky sauce. About 4 oz or 113g dry pasta of your choice, cooked as instructed on package. Mince your garlic and chili pepper and chop your onions and tomatoes. 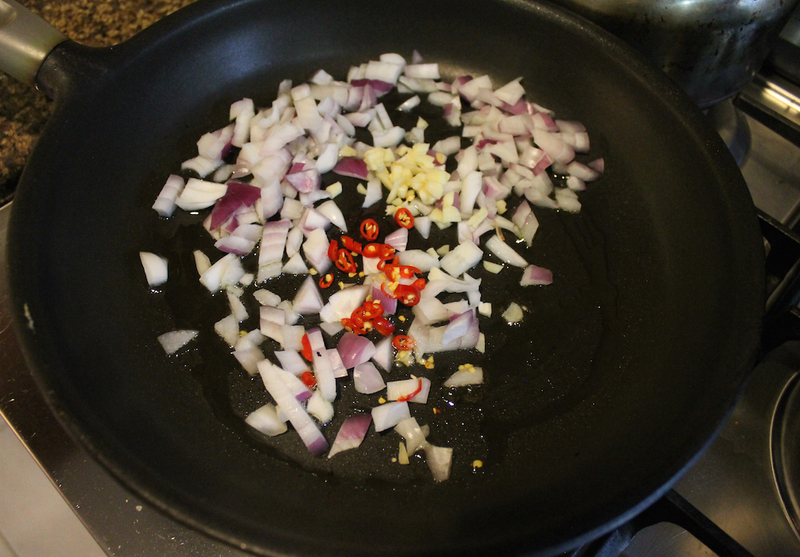 In a large non-stick saucepan, sauté the garlic, pepper and onion in a good glug of olive oil, over a low flame, until soft. 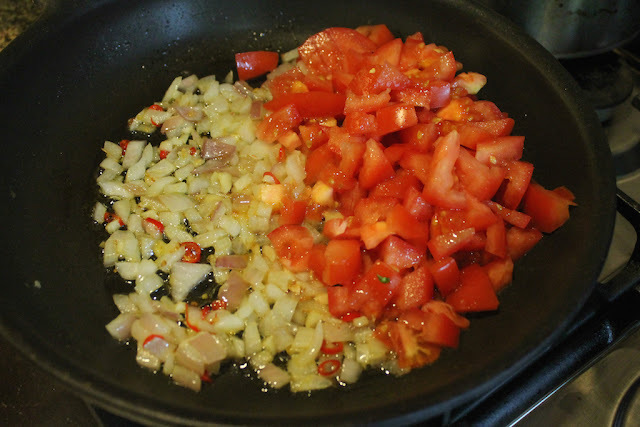 Add in the chopped tomatoes and give them a good sprinkle of salt and freshly ground black pepper. 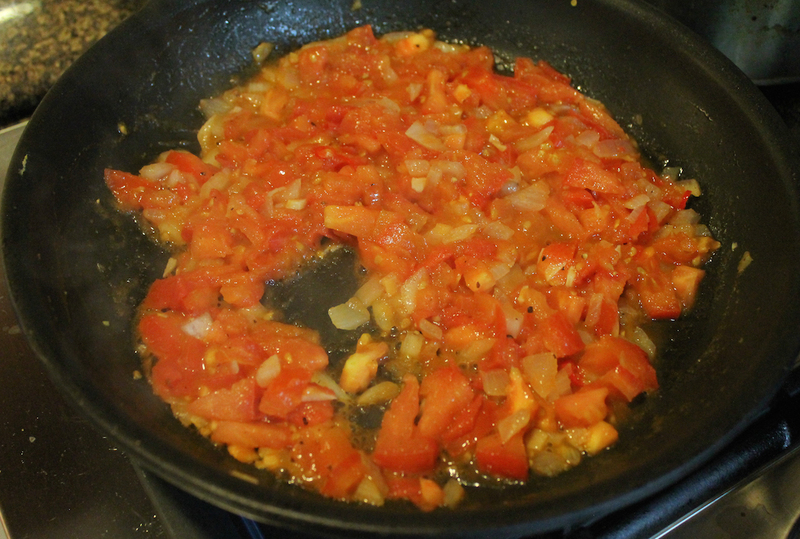 Cook for about 15-20 minutes or until the tomatoes are soft just starting to break down. 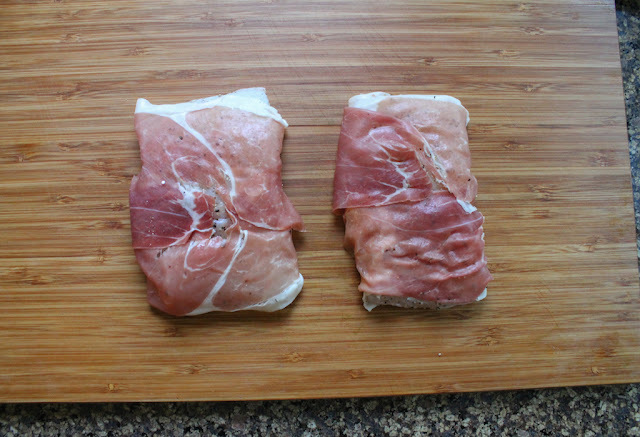 While the tomatoes cook, season your fish fillets with salt and freshly ground black pepper, then wrap them in the Parma ham. 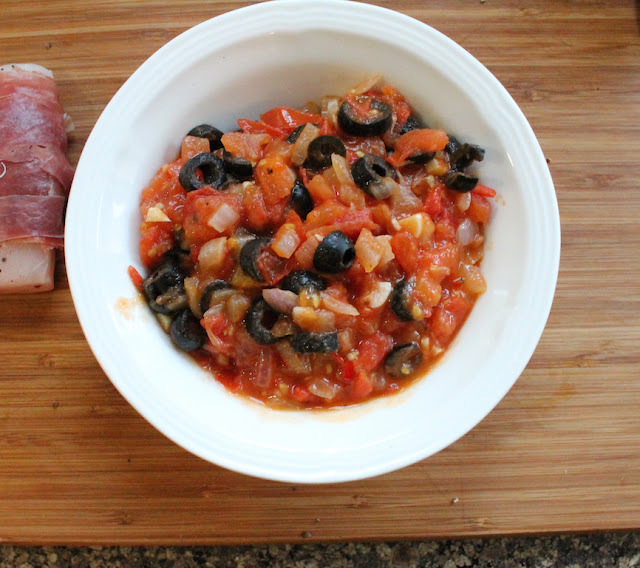 Add the olives to the saucepan and cook for another 5 or 10 minutes. Pile the chunky sauce into a bowl and set aside. This is also a good time to boil and drain your pasta, according to package instructions! Drizzle some more olive oil into the saucepan and turn the heat up. 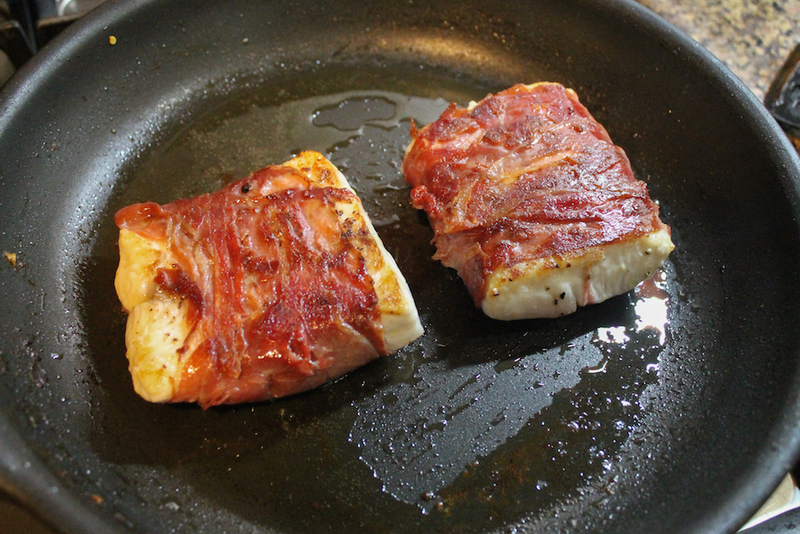 Cook the wrapped fish for about 5 minutes on each side or until cooked through on the inside and crispy on the outside. Actual times will vary depending on the thickness of your fillets. While the fish is cooking, stack your basil leaves one on top of the other and roll them tightly, then slice them finely. This is what the fancy chefs call chiffonade. When the fish is done, remove it to a warm place and return the sauce to the saucepan and reheat it till bubbling. Remove from the heat and stir through the basil. Divide the pasta between two shallow bowls, spoon on some sauce, then perch the fish on top. Drizzle with a little good quality olive oil. Add a bit of the sauce and tiny basil leaves for garnish, if you have some. 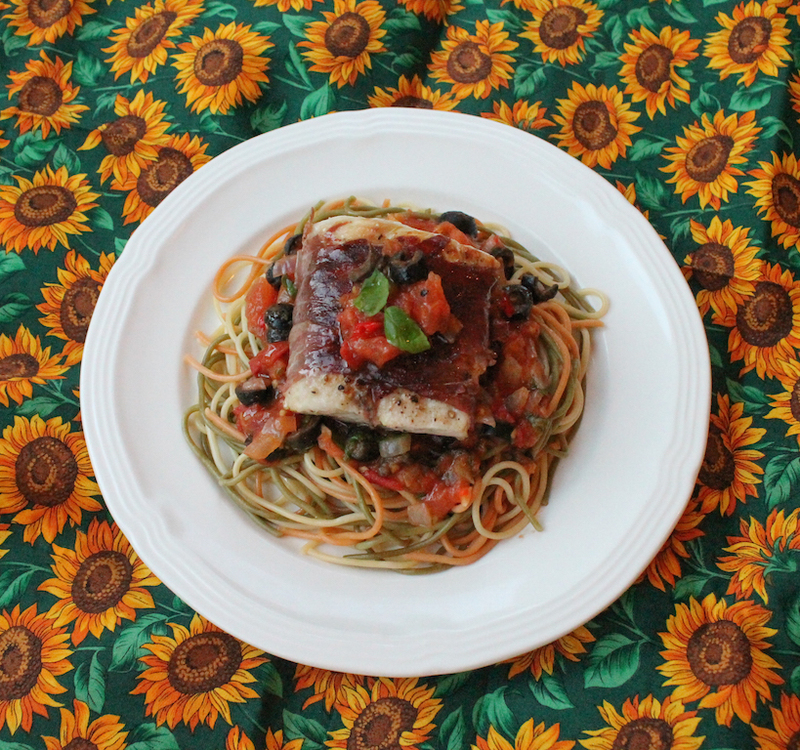 Would you like to join Fish Friday Foodies? 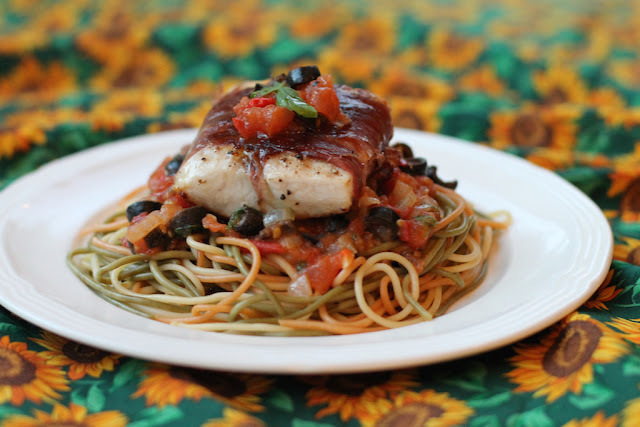 We post and share new seafood/fish recipes on the third Friday of every month. To join our group please email Wendy at wendyklik1517@gmail.com. 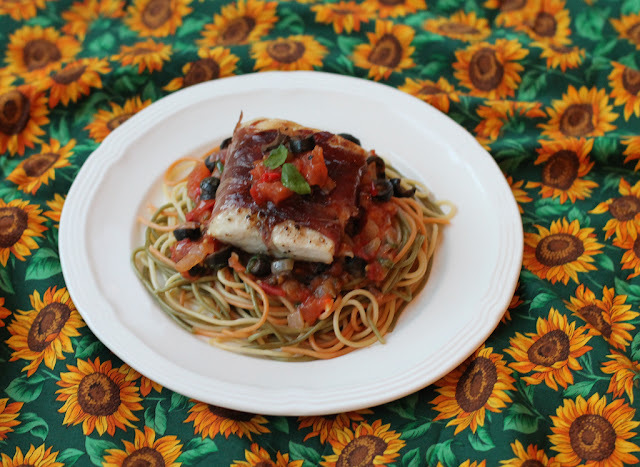 Visit our Facebook page and Pinterest page for more wonderful fish and seafood recipe ideas.